The Sefton Park Breakfast Club, which has provided a service to Sefton Park families for a number of years, is expanding in September. The club is being relocated to Ashley House to take advantage of the wide range of facilities and resources there, including a refurbished kitchen. There will be a range of enjoyable and stimulating activities for children ahead of the school day, as well as a choice of healthy breakfast foods before being taken to their classrooms. Children can choose from a range of freeplay activities including arts & crafts, books, games, role play, and also use the time to complete homework. 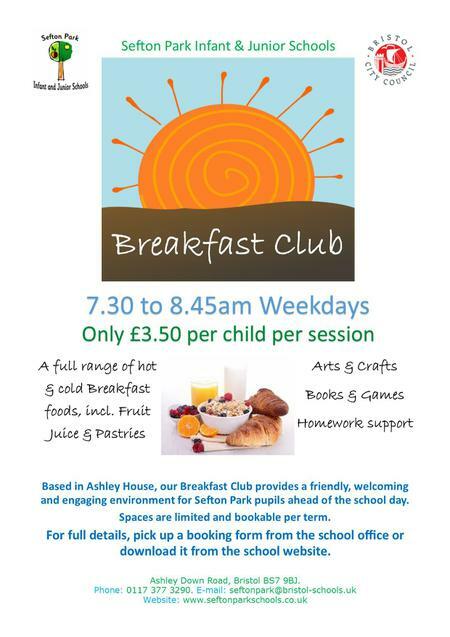 The Breakfast Club is open to all pupils attending Sefton Park Schools and Nursery. It is open from 7.30 to 8.45am, with last Breakfast orders at 08.30. For full details, please see the Breakfast Club Policy. Places are limited to a maximum of 24 children per day and will be allocated on a first-come, first-served basis. Places are bookable per Term and payment must be made in advance via School Gateway on receipt of your booking form to confirm your place.